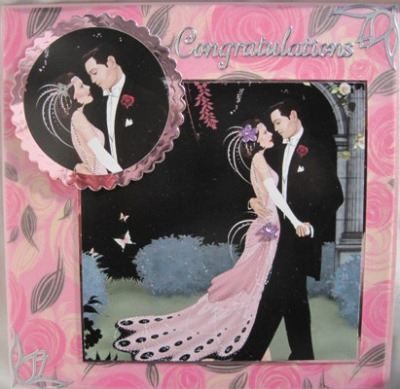 Art Deco-inspired handmade pearl pink card 144mm.sq with picture of romantic couple in evening dress matted on pale pink mirri card, layered onto pink and black stylised roses vellum. 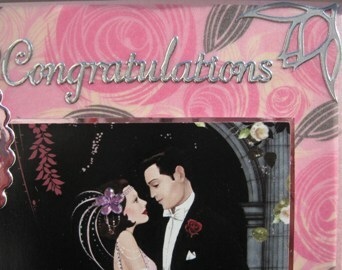 The corners are embossed with silver flower motifs, along with the word Congratulations. 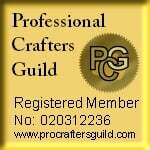 Suitable for Engagement, Wedding,or Anniversary. Please select your chosen greeting for the printed paper insert below.